DIAL: Black matte dial with date window at 3 o'clock and luminous hour markers. White pencil hands with luminous tip center. White spear tip center seconds hand. CASE: 41mm, black bakelite bi-directional 60-minute bezel. Acrylic crystal. CONDITION REPORT: The dial is in mint condition with a nice patina along with the hands. The case has been slightly polished, but still strong. The 'Polish military' engraving on the back has been slightly erased, but 'MW 7375' is still discernable. NOTES: Of the very few (100-150pcs) pieces made of this model, a portion of them were issued to the Polish Navy according to collectors, and engraved with MW and 4 digits. 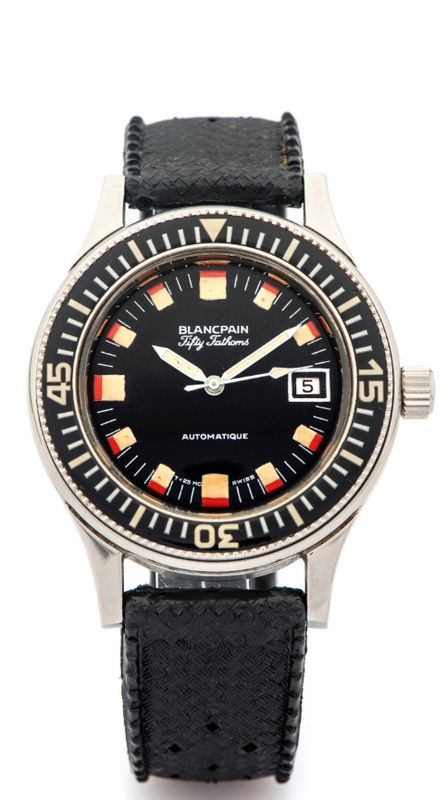 The nickname Barakuda (or sometimes written in English and incorrectly called Barracuda) was the name of diving equipment distributor in Germany which provided the German military (Bund or Bundeswehr) diving watches from Blancpain. Not the fish. Some of these watches were also engraved with Barakuda on the back like the Bund ones and somehow the name stuck only to this model although the Fifty Fathoms 1000 were also engraved with Bund engravings and Barakuda.